Combating illegal, unreported, and unregulated (IUU) fishing is inherently a big data challenge. Billions of Automatic Identification System (AIS) and Vessel Monitoring System (VMS) messages from tens of thousands of active vessels must be sorted and examined to find the few vessels that are likely to be committing illicit activity. On top of that, data visibility problems plague current monitoring systems, with AIS (which can “go dark” at the captain’s discretion) and VMS (which is largely unavailable to the public) both failing to provide the full picture of at-sea activity. In addition to the limitations that exist within these systems, only the largest fishing vessels are likely to carry AIS, and VMS adoption is dependent on coastal states requiring the system. The result is that the picture of maritime activity produced by AIS and VMS requires careful curating and additional analysis before conclusions can be drawn. Spotting these kinds of gaps in the huge amount of data collected can be difficult, but is necessary to identify many types of illicit activity. With such a vast ocean of data to sift through, effective targeting requires focusing on chokepoints. For IUU fishing, the clearest chokepoint is the logistical vessels that support fishing vessels’ clandestine activities. For instance, “reefer” or refrigerated cargo vessels are critical facilitators that help deep sea fishing fleets regularly offload their catch and take on supplies while at sea, thereby allowing them to stay at sea for much longer periods of time than would otherwise be possible. Reefers service entire fleets, serving as a critical link bringing seafood— both licit and illicit—to shore. These reefers are far fewer in number than fishing vessels, and are much more likely to regularly transmit AIS signals, making them a visible data point that analysts can exploit. C4ADS’ partnership with Windward enables us to use this type of data in our analysis. Using Windward’s maritime risk analytics platform, C4ADS is able to access structured several years’ worth of historical data on vessel operations. The platform is easily filtered according to customizable search queries, allowing tailored, hypothesis-driven analysis of specific questions. “Drifting” – Windward uses this term to denote vessel movement under 3 knots, which is the usual speed at which two adjacent vessels would travel to transfer goods, catch, or crew. High Risk Zones – Windward allows analysts to define zones where suspicious activity, such as ship-to-ship transfers, IUU fishing, or sanctions violation, commonly occurs. Flags of Convenience (FOC) – Vessels engaging in illicit activity often use flags of convenience as a means of obfuscating their ownership or avoiding legal action or scrutiny. FOCs are a means of circumventing regulatory oversight with little to no barrier to entry. “Meetings” – Windward applies machine-learning algorithms to detect anomalous ship activities, including meetings between vessels at sea, for extended periods of time. Vessels that “meet” for extended periods of time are more likely to be refueling at sea or transferring catch, crew, and/or supplies (known as transshipment), potentially in violation of law. 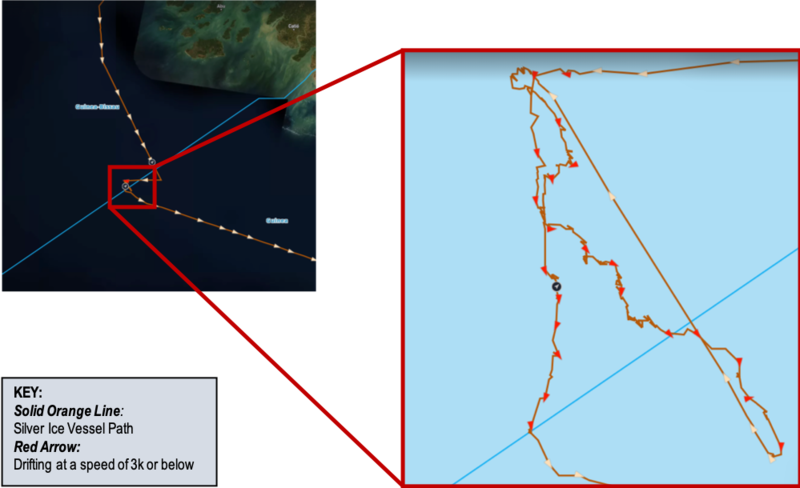 As an example, we will walk through a case in which Windward tools helped C4ADS analysts hone in on suspicious vessel activity and then map the corporate network behind three refrigerated cargo vessels. *On February 23, 2019, the Gabu Reefer reflagged from Comoros to Moldova. Drifting near areas where fishing vessels from the same corporate fleet operate. These behaviors are common for vessels that are transshipping, but do not necessarily indicate illicit activity. However, when this activity is observed in a particular high-risk zone, such as the EEZ of Guinea Bissau— where at-sea transshipment has been banned since 2015— this behavior warrants further scrutiny. The SILVER ICE "drifted" on the border of the EEZ of Guinea Bissau and Guinea between January 9 and 11, 2019. Toward the end of its "drift", the SILVER ICE changed its destination from Monrovia, Liberia to Conakry, Senegal. All three vessels, along with at least four other trawlers, are registered to several Panama-domiciled companies, which are all ultimately controlled by Sea Group SL, a company incorporated in the Canary Islands. The Panama connection is a red flag for our analysts, as the country has frequently been criticized by experts as a haven for tax evasion, money laundering, and other illicit activity. Vessels in Sea Group SL’s fleet have also been implicated in risky activity. For example, in 2014, the GABU REEFER was fined US$2,000 by Liberia for landing fish without the necessary authorizations. Then in 2015, the SILVER ICE was categorized as a high-risk vessel by the West Africa Task Force (WATF) after the government of Comoros raised concerns about the vessel’s activity in the region. While it is unclear what activity directly incited those concerns, the SILVER ICE was documented landing catch sourced from Guinea Bissau and Guinea in numerous ports in West Africa at the time. Inquiries into the SILVER ICE were also in part due to pressure from the European Union for Comoros to increase oversight of distant water fishing vessels registered under their flag. Flag registration in Comoros is reportedly controlled by the Administration of the Union of Comoros and is an open registry. This means that in Comoros, foreign companies are able to register vessels without proving a “genuine link” to the country and oversight is outsourced to private interests. Finally, in 2017, the SALY REEFER was caught carrying out an illegal transshipment with three other ships in the EEZ of Guinea Bissau. The owners and crew members reportedly faced fines and legal action as a result of the illegal transshipment. Sea Group SL, incorporated in the Canary Islands, beneficially owns a fleet of at least seven vessels. Four of these vessels were implicated in an illegal transshipment in the EEZ of Guinea Bissau in 2017. At sea transshipment has been banned in Guinea Bissau since 2015. Ultimately, fully understanding illicit maritime activity requires going from sea to shore. A vessel is just an asset owned by an onshore network, and its activity at sea is ultimately determined by the financial interests of its beneficial owners. C4ADS therefore believes effective maritime analysis requires both at-sea and onshore analysis to connect vessel behavior to corporate networks. C4ADS’ Natural Resources Cell is committed to using these and other methods to combat IUU fishing. Windward’s technology is a critical part of this effort, helping our analysts identify high-risk activities at sea that can be tied to on-shore corporate networks. Directing this information to the right authorities can then result in real action—like arrests, seizures, and ship detentions—that have a tangible effect on the overall trade in illicit fish products. On Tuesday, the United Nations Panel of Experts released its 2019 report on North Korea’s sanctions evasion and WMD programs. The Panel found that—even today—a limited number of trusted overseas commercial facilitators continue to engage in a wide range of revenue-generating activities for the Kim regime, often using overlapping corporate architecture that can be exposed through shared addresses and phone numbers. Li Zhengang (李振刚) and his accomplices are but the latest example. 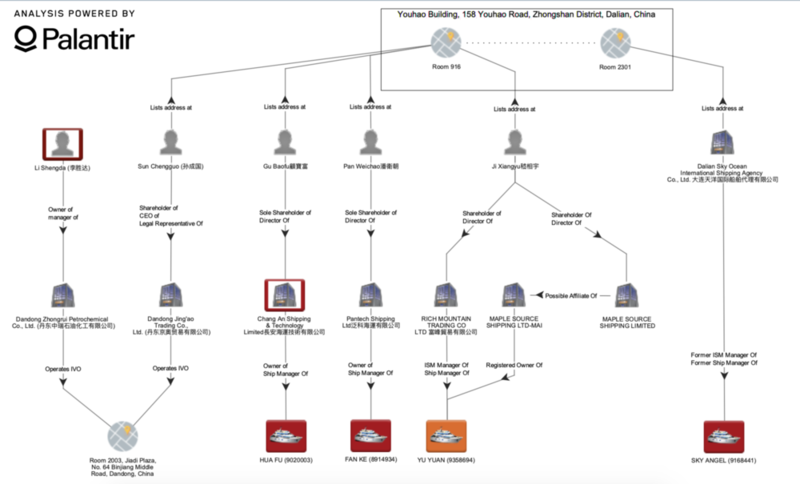 Chinese national Li Zhengang was first identified in the 2017 midterm report for owning 70% of UN- and US-designated Daedong Credit Bank, which OFAC sanctioned in June 2013 for supporting North Korea’s ballistic missile and WMD programs. The Panel found that Li also controlled two other companies, one of which remains active: Dandong Zhongrui Petrochemical Co., Ltd. (丹东中瑞石油化工有限公司). 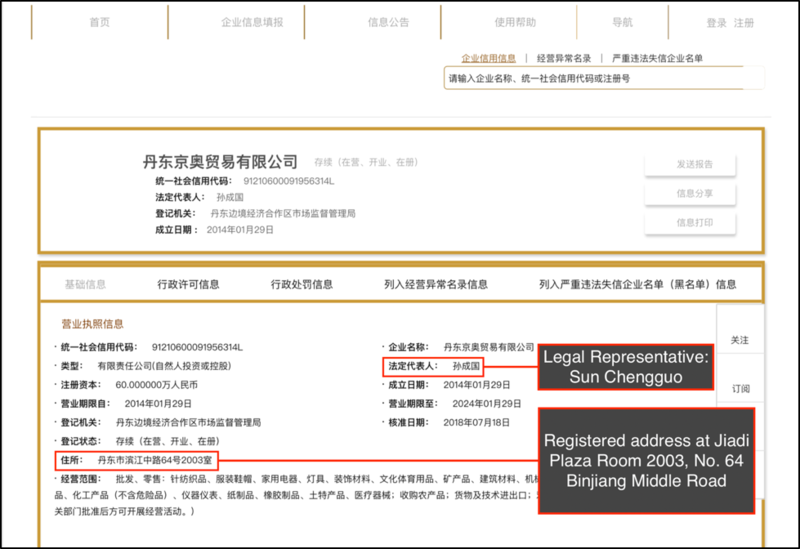 Zhongrui’s Chinese business registry filings indicate that it is registered in Dandong, China at Jiadi Plaza on No. 64 Binjiang Middle Road (滨江中路64号). If the address sounds familiar, that’s because it has appeared before: the same building also hosts a number of other companies sanctioned for supporting North Korea’s WMD program, including but not limited to OFAC-designated Dandong Zhicheng Metallic Material Co. , the subsidiary company of OFAC-designated Dandong Hongxiang Industrial Development Co., and further still its subsidiary DPRK restaurant. In Tuesday’s report, the Panel showed that Li Zhengang’s network also has ties to a number of DPRK shipping operations through companies in both mainland China and Hong Kong. Chinese business registry filings show that Dandong Zhongrui shares an address with Dandong Jing’ao Trading Co. (丹东京奥贸易有限公司), with variation only in the character used to refer to room number. Dandong Jing’ao Trading appears to have had a Hong Kong-registered affiliate that used an identical name until March 14, 2017. Registry filings for both the mainland- and Hong Kong-registered Jing’ao companies list a Chinese national by the name Sun Chengguo (孙成国 or 孫成國) as director. The Panel notes that, as in the case of Dandong Zhongrui Petrochemical, Sun Chengguo used a residential address with ties to known DPRK entities: Room 916, DL1504, Youhao Building, 158 Youhao Road, Zhongshan District, Dalian, China. An almost identical address has also been used by multiple other Chinese nationals engaged in DPRK maritime sanctions evasion operations: Gu Baofu (顧寶富), the director of US- and UN-sanctioned Chang An Shipping & Technology Co., Ltd. (長安海運技術有限公司); and Pan Weichao (潘衛朝), the director of Pantech Shipping Limited (泛科海運有限公司) and an emergency contact for the Marshall Islands-based operator of the Jie Shun, a Cambodian-flagged cargo vessel that Egyptian authorities seized in August 2016 for carrying RPGs and various subcomponents from the DPRK to Africa. But Sun Chengguo, Gu Baofu, and Pan Weichao are not the only individuals who list an address at Room 916 of 158 Youhao Road. In fact, when we searched for more co-located people and companies, we found that a fourth Chinese national Ji Xiangyu (嵇相宇) used an almost identical residential address in an alleged scheme to launder prohibited DPRK coal through Far Eastern Russian ports in late 2017. 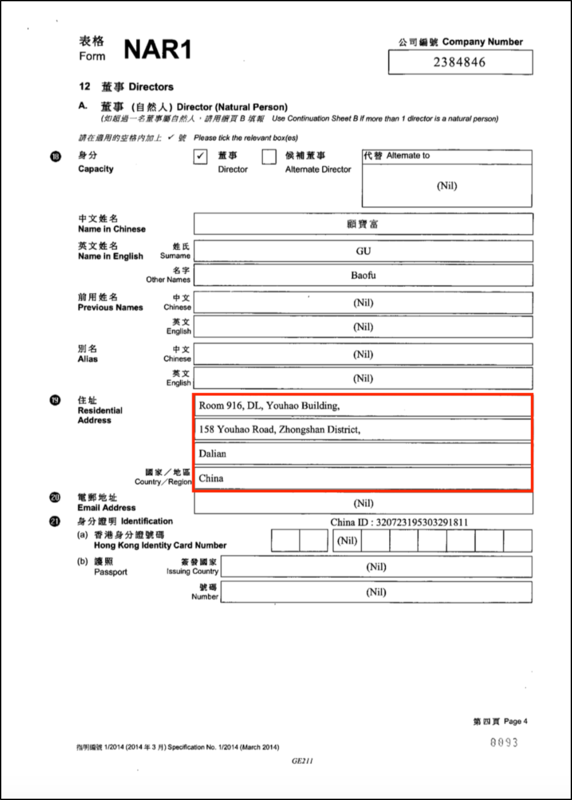 On a 2017 annual return, Ji Xiangyu listed the address on a filing for his company Maple Source Shipping Limited (楓源海運有限公司), a Hong Kong-registered company whose plausible Marshall Islands-based counterpart owned the Togo-flagged Yu Yuan (IMO 95358694). In the fall of 2017, the Yu Yuan, along with other DPRK-flagged vessels, unloaded coal from North Korea at a coal terminal in Kholmsk, Russia. The coal was subsequently transshipped from Kholmsk to South Korea by several foreign-flagged vessels, one of which—the formerly Panama-flagged Sky Angel (IMO 9168441)—was managed by a Chinese company named Dalian Sky Ocean International Shipping Agency Co., Ltd. (大连天洋国际船舶代理有限公司) and is also registered at 158 Youhao Building, albeit in a different room. The corporate network behind the Yu Yuan has changed since it was first exposed in early 2018. Equasis vessel ownership records pulled as recently as November 2018 indicated that the Yu Yuan’s owner at the time of transshipment was “in the care of” Rich Mountain Trading Co., Ltd. (富峰貿易有限公司), a second Hong Kong company of which Ji Xiangyu is the sole director and shareholder that had served as the Yu Yuan’s commercial and ISM manager at the time of transshipment. However, Rich Mountain Trading no longer appears in the Equasis database or the Yu Yuan’s ownership and management history. On Rich Mountain’s corporate filings, Ji Xiangyu reported a residential address nearly identical to that used on his first company’s filing and by Sun Chengguo, Gu Baofu, and Pan Weichao: Room 916, DL1398, Youhao Building, 158 Youhao Road, Zhongshan District, Dalian, China. North Korea’s overseas commercial operations depend on a limited number of facilitators who are both highly capable and willing to undertake significant risk. As we observed in Dispatched, there are strong economic incentives for a resource-strapped regime to co-locate its overseas activities at a limited number of physical locations. This allows them to reduce costs while engaging in bank transactions, coal sales, technology purchases, surveillance of workers, shipping operations, and other revenue-generating activities for the Kim regime. Law enforcement and civil regulators can and should use the inherent exposure of a fixed physical location to uncover the full portfolio of DPRK sanctions evasion activities. So what else is at Dandong’s No. 64 Binjiang Middle Road, Dalian’s 158 Youhao Building, or at any other addresses associated with DPRK commercial facilitators? In any investigation, law enforcement and civil society should be sure to check. Public data is essential for anticorruption research. Many countries publish online databases of public records of all varieties, from court filings to corporate registries, from timber exports to plane registries. These are critical sources of credible information for anticorruption researchers, investigative journalists, and civil society groups around the world. The way these datasets are structured ranges from individual records to bulk data, and every type in between. Merely collecting raw data only takes us halfway to conducting the kind of impactful analysis that we seek to provide. Any individual source of information, from a full corporate registry to a single judicial transcript, can be useful – however, keeping data sources separate keeps insight isolated, meaning you have to do a lot more work to discover illicit activity. By integrating and comparing datasets across formats and jurisdictions, C4ADS’ Organized Crime and Grand Corruption Cell is able to more comprehensively and efficiently understand the transnational illicit networks we research and the systems in which they operate. When datasets are joined together, individuals and entities that appear separate can form networks, while examining activities allows us to identify interesting trends from large datasets. In the modern world, criminal networks, including those that facilitate North Korean overseas labor or that specialize in wildlife trafficking worldwide, are able to move fluidly from jurisdiction to jurisdiction, deftly navigating the bounds between the illicit and licit worlds. Whenever illicit networks touch the licit system, they leave a paper trail that researchers can track – C4ADS uses public records to identify the networks that operate in the illicit economy. As we go through and investigate each person or company we come across in our research, we uncover dozens of related records. The trick to making these data points useful and actionable is knowing how to tie them all together, and what they mean when combined. Investigating the people and companies in a network can lead to the discovery of more specific data points, like luxury plane travel, export licenses, and property purchases, which all provide a better picture of how a particular network actually operates. When a Venezuelan businessman was indicted by US prosecutors in November 2018 for embezzling funds from the Venezuelan state-owned oil company PDVSA, we started to investigate his business dealings and the network around him. After structuring the data we uncovered in the course of our research, we found a key business associate that appeared to facilitate the business dealings of this network. This business associate co-owned businesses in the US, and we also discovered that they were family. From there, we searched property records and airline registries to see if any of the companies or individuals in the network owned luxury planes, homes, or other big ticket items. Companies in the network owned luxury homes and a plane in South Florida, a key piece of information that led us to activities-based analysis. To use activities-based analysis to investigate aircraft, we apply the knowledge we already have about illicit activity involving aircraft to build a pattern we can look for in the data. Since the US government publishes the registration numbers of aircraft owned by now-indicted and sanctioned individuals, there are readily-available examples of illicit activity to analyze in the open source. Using a simple aircraft registration number published in a press release, we are able to connect an aircraft to its owner in an aviation registry, and we simultaneously viewed historical flight data from flight-tracking platforms like ADS-B Exchange. After analyzing historical flight data to identify where aircraft of interest have been in the past, we can find other aircraft that follow a similar pattern. 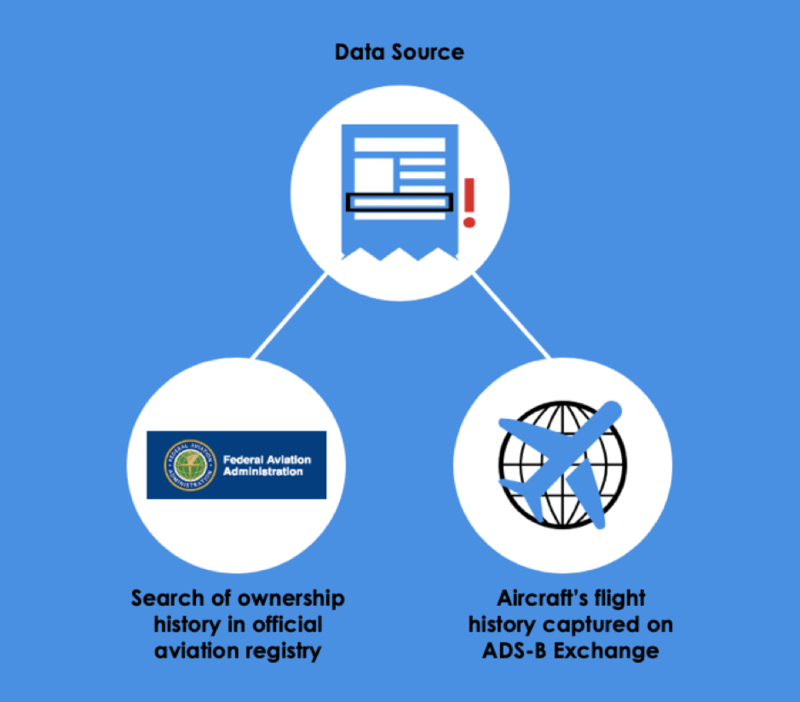 Additional information, like whether or not the aircraft is registered in a secrecy jurisdiction, provides further clues of suspicious and potentially illicit activity. In the previously mentioned money laundering case involving the Venezuelan businessman, a sanctioned aircraft’s transmissions revealed that its flights were almost exclusively between South Florida and Caracas in the months prior to the plane being sanctioned. A different, unsanctioned plane that was publicly reported to operate in connection to the same network revealed almost identical flight patterns to that of the OFAC-sanctioned plane. This raised many interesting questions, and by identifying this activity we are able to further our investigation and uncover new layers of the network’s activity. A now-sanctioned plane making same-day flights between Caracas and Florida, with a possible stop in the Dominican Republic, as revealed by the plane’s ADS-B transmissions. Historical flight information courtesy of ADS-B Exchange. An unsanctioned private plane, connected to the sanctioned plane, reveals a very similar flight history, both in location and time. Historical flight information courtesy of ADS-B Exchange. Identifying patterns or typologies of crime can provide a useful methodology, and it can assist in finding illicit activity that emerges from the open-source. In this way, using both network- and activities-based analyses allows us to sift through an immense amount of public data to find cases that are most interesting to the public, the most relevant to our research, and the most impactful for our partners. Furthermore, although a simple network-based analytical approach provides a useful roadmap for researching corruption, being able to highlight the actual activities of a network makes the results of anticorruption research much more dynamic, enlightening, and actionable. At the upcoming 2019 OECD Anti-Corruption & Integrity Forum, we will dive into these issues and our methodologies further to provide a glimpse of how C4ADS analysts and partners work to untangle the webs woven by illicit actors. If no one understands your research, did it really even happen? At C4ADS, we think hard about how to turn our research into concise analytical findings. Consistently, we find graphics to be one of the most effective ways of condensing research into a single, comprehensible format. Our work often requires the explanation of complex networks, relationships, and patterns that would be nearly impossible to make sense of without graphics. Good graphics pack in a lot of information, but they also drive you to ask questions and dig deeper. Getting this right depends on choosing the right graphics. Representing the data in a dishonest or confusing way is worse than not using graphics at all. Here, I wish to highlight a few examples in which we have structured complex and large data sets to make them intuitive and informative. This work would not have been possible without the R Suite of software and our wonderful Senior Analyst, Patrick Baine. 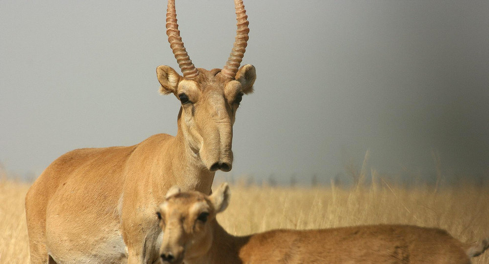 How do you map the air transit routes used for wildlife trafficking? This is not an easy task, especially given the lack of open source data on the issue. 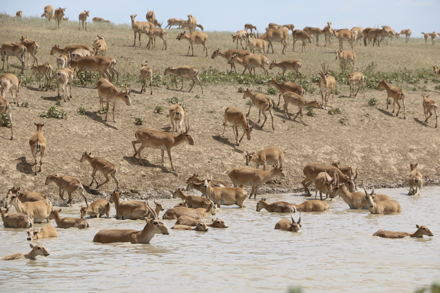 For the ROUTES project, we needed to reconcile several different databases of seizures in the air transport sector of various wildlife products to help industry, government, and civil society better understand the flow of these products. This map is helpful because it gives you a few pieces of basic insight right when you first look at it. It then prompts you to ask questions. There appears to be more activity in Europe, Africa, and Asia; why? Why is there so little in North and South America? What about Australia? I don’t usually think of Western Europe as a trafficking hotspot, so what is going on there? If you were to look at the spreadsheets of data that went into this graphic, I doubt that many people would come away with the same level of insight as they would by looking at the graphic. Graphics like this help you see the bigger picture and then encourage you to ask important research questions. For this project, C4ADS analyzed World Customs Organization data to determine patterns in the trafficking of cultural heritage objects, such as antiquities, art, or other significant objects. This graphic shows the flow of cultural heritage trafficking in 2016. The chart visualizes the flow of goods from the country in which they originated to the destination country, as indicated by the arrow. The number of goods per country can be seen along the edge of the circle. This is another graphic that 1) is pleasing to the eye, 2) does a great job of conveying movement (before you even have context, you know something is moving from one place to another), and 3) raises questions. One question that is raised by this graphic is what happened to the cultural heritage flowing out of Syria given the context of events there in 2016? Given the news coverage of the issue, I would have expected to see that show up here, and yet… Questions like this require more digging to answer, and can even become the base of full-fledged C4ADS projects. For the same WCO project, C4ADS received a different dataset related to seizures of narcotics. While flows were interesting, other patterns related to time of seizure told an equally compelling story. This jitter plot represents seizures of psychotropic substances in 2016 by country. From the chaos of dots, patterns emerge. Again, this graphic gives insight, but also points to important questions and next steps for further research. What caused the increase of seizures in the second half of the year in Germany? Why did Estonia have a drop in seizures at the end of the year? Was there a reason that Hungary started reporting seizures in March? What about the trends within the types of psychotropic substances being seized? Most strikingly, what caused the glaring disparity between the frequency of seizures in the United States compared to the rest of the world? By looking at this graphic, you can both gain knowledge and understand that there are underlying trends in drug trafficking that require further study. These are only three examples from one of the multiple platforms we use to develop graphics, but I think they do a great job of demonstrating what great graphics can do, and how they can add to stellar research. The complexity of the world in which we live and the data it produces will only continue to grow. We want to continue to explore new and innovative approaches to open source data and analysis, and eye-catching and insightful graphics are going to be a key component of our approach. We are proud to announce the formation of our new blog. This platform will allow our readers a look behind the curtain at C4ADS to get a glimpse of our processes and on topics that interest our analysts. For those of you who are not already familiar with our work, C4ADS is a nonprofit organization dedicated to providing evidence-based reporting and analysis on transnational security issues. Around the world, bad actors are able to hijack licit infrastructure to accomplish their illicit aims: our mission is to make it more difficult for these bad actors and their networks to function. To do this, we use cutting-edge technologies and methodologies to analyze disparate datasets, shedding light on problems of corruption, crime, and conflict. Sound a little confusing and intense? We know what we do can be puzzling to people who don’t know us, but we hope this blog will provide a better understanding of what we do as an organization. Plus, our background provides some very interesting material that we wish to share with our readers. What should you expect to read on this blog? Without giving too much of the suspense away, one can expect to read posts on everything from how Facebook posts can be used to deter illegal poaching of endangered animals, to follow-ups on previous C4ADS reports, to how we use different technologies to simplify our data for consumption. On this page you can expect to meet a rotating cast of North Korean proliferators, ivory and pangolin traffickers, Middle Eastern terror financiers, and other associated bad actors. And that’s just our analysts. These and many more riveting topics will be explored and posted on this blog page. To make sure that you do not miss any content, sign-up to have C4ADS blog posts delivered directly to your inbox at the bottom of this page. We hope that you are as excited as we are for the launch of our blog—happy reading!